Elder (Apostle) Harry L. Jackson was born in Rochester, NY, on July 2, 1962, and served in the United States Army from 1981-1989. After leaving the Army, he resided in Germany for 11 years, and accepted Jesus Christ in November 1991 in the Germany Jurisdiction of the Churches of God in Christ, where he served until 1999, first as an Usher, and then in Audio Ministry, Sound Reinforcement, Evangelism, his local, district and Jurisdictional Music Departments, as a choir member, psalmist, worship leader, and musician, provided computer support, and helped to establish a ministry in a refugee camp in Germany. On March 5, 1995, he answered the call of God to preach the Gospel, and received his Ministerial License in October 1999, upon his return to the United States. He was ordained as an Elder in February 2005, and as a Pastor in June of 2007. 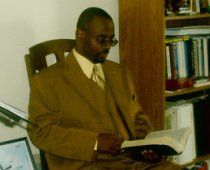 Apostle Jackson holds Associate degrees in Christian Ministry, Business Administration, Computer Programming, and Web Design, and will pursue his Bachelor's in 2013. Bro. Jackson served as Professor of Homiletics at United Christian Ministry Institute Rochester, New York Campus, from 2010-2012, and was awarded an Honorary Doctorate in Christian Ministry in 2010. He founded Christ Foundation Ministries, Inc. in 2007, and after serving three years under the oversight of Chief Apostle Bernetha Mouzon of Global Dominion International Network of Christian Churches and Businesses, with whom he cofounded ECAPS (East Cost Apostolic and Prophetic Summit), was commissioned and ordained as an Apostle on September 16, 2012. In addition to his other ministry activities, Apostle Jackson serves on the leadership team of God House of Prayer Holy Temple (GHOP) in Rochester, NY. with Apostle Jeffrey and Pastor Twanda Wynter.